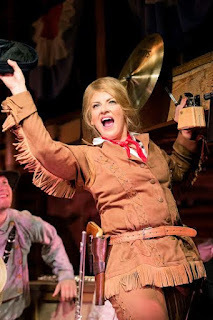 It’s not every day that you get the opportunity to be thrown headlong into the Old West, surrounded by dust, booze and petticoats but with Calamity Jane, you can do just that. Based on the 1953 film of the same name, the stage production sees Doris Day’s character, the aptly named ‘Calamity’ Jane, causing a ruckus wherever she goes with her un-ladylike ways in 1880’s America’s Wild West. In a time when women are expected to fulfill a particular role (of homemaker and attractive ornament), Calamity breaks all the rules that men create for her. The musical extravaganza with an Oscar-nominated stars Jodie Prenger as Calamity and follows her journey to Chicago to return the revered actress Adelaid Adams to Deadwood, Dakota, to delight the men of the town. Instead, she returns unknowingly with the actresses maid, Katie Brown (Sophia Ragavelas), who deceives Calamity in a desperate attempt for her own slice of fame. The centre of the action is the saloon and its performance area, allowing the music to take centre-stage. Every piece of music is played by the actors as an apparent bystander becomes a musician, interchanging between piano and fiddle with ease. The action and music flow seamlessly, and the cast inhabits this with an energy that is infectious. There are mass sing-a-longs to ‘Just Got in from the Windy City’ and ‘the Black Hills of Dakota,’ taking you from one toe-tapping dance routine to the next. The cast are hugely talented, with outstanding vocals from Prenger and Ragavelas. Essentially a love story in an era where relationships cause smashed glasses and shootouts as Katie’s relationship with Lieutenant Danny (Alex Hammond) provokes a jealous fury in Calamity. However, Calamity eventually finds unlikely solace in ‘Wild’ Bill Hickok (Tom Lister), who finally overcomes his constant chastising of Calamity’s fearsome ways as she softens her hard exterior. As an audience, you are thrown full pelt into these fast-paced Western brawls and sing-a-longs in the midst of romantic chaos. 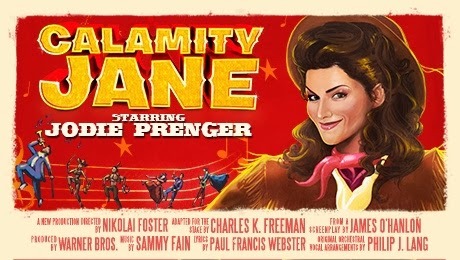 Prenger as Calamity is as hilarious and exaggerated as you’d like her to be, whilst tearing up the rulebook as a character not wishing to adhere to anyone’s expectations. Although the story differs very little from the film in terms of its content and songs, the show is funny and very much alive. Receiving an almost full standing ovation, the audience was fully invested. It has romance, it has laughter, and it has music to match. As the saying goes, if its not broken, don’t fix it, and there is not much to fix about Calamity Jane.